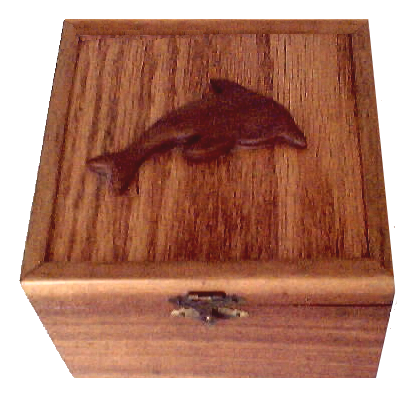 Over the years I've made many little wooden boxes. My technique made a huge change after seeing a video made by the late Jim Cummins. His passing was a huge loss for woodworkers as he had the skill and patience to make even the most difficult operations safe and simple. From his video I rethought and changed the way I made the tops, plus learned how to make the boxes have perfect grain matching all the way around. People are always amazed when they see the grain matching so perfectly on all sides. The first step is trying to decide on box thickness. The thinnest box walls that I have made were just 1/8", but the result and even 3/16" thick material was way too fragile, plus hinges had to be made from cloth and the catch with either Velcro or a magnet. A much better and more durable wall thickness is an even 1/4". That thickness does not look good on boxes that are much smaller than 3"x5". At first I used to live with the often too large brass hinges and catches available from my local box store. I then shifted to mail ordering because I could get the sizes I wanted and for a much better price. Then a lady friend pointed out that her craft stores had dozens of styles of nice little brass and antiqued brass hinges and catches for a fraction of what I was paying. I just bought a pile of them of all different types and keep them around in case I need a quick, but "special" gift. Although curly maple and many other woods make beautiful boxes, you need to look at your tools and how much work you are willing to do. Any imperfection or tear-out can make a beautiful project just look terrible. With a drum sander and fine planer, material is really not that much of a challenge to me now, but before I got those nice tools I had to stay with woods that were easier to work without so much sanding. My favorite is still walnut, but I've made some beauties out of zebrawood, cocobolo, wenge, and purple heart. With each of those choices, including the walnut you need to keep a good tight daul cartridge type filter mask on as they are all toxic to some degree and can rapidly build up some terrible allergic reactions. I generally start with a surfaced piece of wood that is two times thicker than I need plus about three band saw kerfs. Its width should be just sanding thickness less than the height of the box. Its length should be with clean ends, just as long as the front and one side of the box plus about 1/2". Hang in there and I'll tell you what that 1/2" is for. The trick to making the grain match all the way around is to realize that if you spilt a board by resawing it not only bookmark matches side to side, but the end grains match end to end. If you start with a piece just the right length and resaw it in half then match the two inner faces that were just sawn, both ends will match perfectly! Likewise by making 90 degree V cuts on those same faces the other two edges of the box around the outside will match perfectly! On the right is a picture of how we are going to cut our stock. 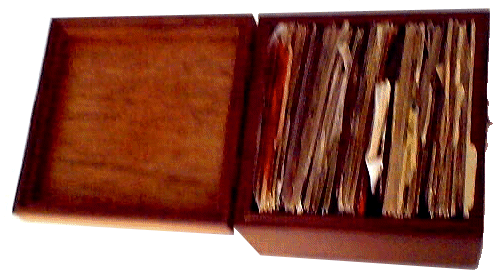 The secret to this type of box is using thin 1/8" plywood for both the top and bottom. The plywood will not move much at all so can be safely glued in place on the top and bottom to make a very strong unit. Moreover, putting a lip on the lower portion of the box and a mating rabbit on the upper will make for a tight fitting lid that will not move around keeping the catch and hinges from loosening for years. Without that groove or some other similar support, most boxes will only take just a little use before they quickly begin to fall apart. On the right the top picture shows how we precut the side grooves. The bottom picture shows what one half of our blank looks after we resaw with the bandsaw. And, the center diagram shows how the pieces go together. I measure the length of a face then add the depth of the kerfs less 1/16th. That allows room for extra glue so it does not squeeze out and make a mess inside my box. Next I carefully put a T on the top and B on the bottom in pencil that can be erased. You have to do this because once glued up it is near impossible to know which end is up if you use double sided ply as I prefer! I carefully put masking tape going vertically on each joint. This keeps the glue squeeze out from getting on that box. That is a little overkill as the pre-finishing keeps the glue from sticking. Using my syringe type glue applicator on the inside of the top and bottom groove and on the box edges lets me have the control to get enough glue on without making a big squeeze out mess. I insert the top and bottom and roll it up taping that fourth joint just to hold it steady. Although I have a wall of clamps, what I use for clamping while the glue is drying is a little embarrassing. I got an old inner tube from my wheelbarrow and sliced it into 1/2" wide rubber bands. They are tough to stretch, but they really do a great job holding all together while the glue dries. Moreover, because the tops and bottoms are square and a pretty close fit, the result ends up nice and square. This is actually harder than you might think, but here is where we get to use those two little pieces left from making the sides. Notice they already have the grooves in them? Yes, and it just so happens that there in pencil is a little T and B on the box. Those tiny pieces can be used to set the fence on the table saw just right to make a cut that is just above the inside cut. By carefully setting the depth and position, you can make the lid as tight as you would like. I found that too tight is easily repaired with a little light sanding, too loose is a problem. Once the saw is aligned just right and you carefully test it on those pieces (push sticks required here big time), you are still not ready to cut the top off. If you were to just cut now you would either have the top come loose on the final cut and badly scar the wood, or the box would be so tight you would have to slice it open by hand. What works best for me is cutting the top and both sides, then slipping a piece of material that is the same thickness of the kerf just above where that fourth cut will be made and using masking tape to hold it in place. I also put a piece on each side for the top as well. This will keep the box from being able to close up when the cut is done. Whatever finish you choose is up to you, but I prefer to use a few coats of wipe on poly, particularly for recipe boxes that will get touched by dirty or wet fingers. I like to make with my scroll saw a little wooden figure, decoration, or name that I glue on the top before finishing. You can also buy these kinds of things at the craft stores and mail order. While the finish is drying use a pair of wire cutters to shorten all brads to a length just shorter than the holes to be drilled. After the finish is dry pounding in the brads that come with the hinges will spilt the wood and ruin the hardware. Instead, use a fine drill that is just under the size of your brads with a stop collar to make sure you don't drill through the sides. My stop collar is a dowel with a hole down the middle. Now carefully lay the hardware in place for the hinges and put with a fine tipped applicator one drop of cyanoacryllic (super-glue) through a hole on both the top and bottom of each hinge. It should spread by itself to glue that hinge down nicely without going into and gumming up the hinge. Gluing the hinges down makes lets you drill with a stop collar perfectly placed holes of just the right depth. I press the brads in with a pair of pliers with cushions on the teeth. Flip the box over and do the same thing with the front latch making sure it is near its maximum extension to make for a nice tight fit. It will loosen to just right after a few uses. And again one big caution, I often end up making a bunch of these all at once, often just before Christmas. This is one of those highly repetitive tasks that can easily get taken for granted and lead to an inattention accident.